I work out / run with them. Hello, running with other people is the best! I used to not be so sold on it, but my BRF Mar and Julie (and many others) have totally sold me on the idea of how fun it can be to use running as catch up sessions. It’s the best! I cook for my fiance. Introducing him to healthy foods is so fun and he really is so appreciative. The other day I made him homemade turkey burgers and taught him how quick and easy it is. He raved about those burgers and I literally made them while I was running a bath for myself. Quick and easy. I try and encourage my friends / family who have their own healthy living journeys. I have tons of friends and family members who are getting into healthy eating, running, dancing, etc. I try and be as encouraging as I can because I know how much it pumps me up to have support. I’m very public with my successes…and my failures. (Ahem). Keeping it real matters. I’m not perfect but I know that I’m inspired by honesty and I think others are as well! What about you? 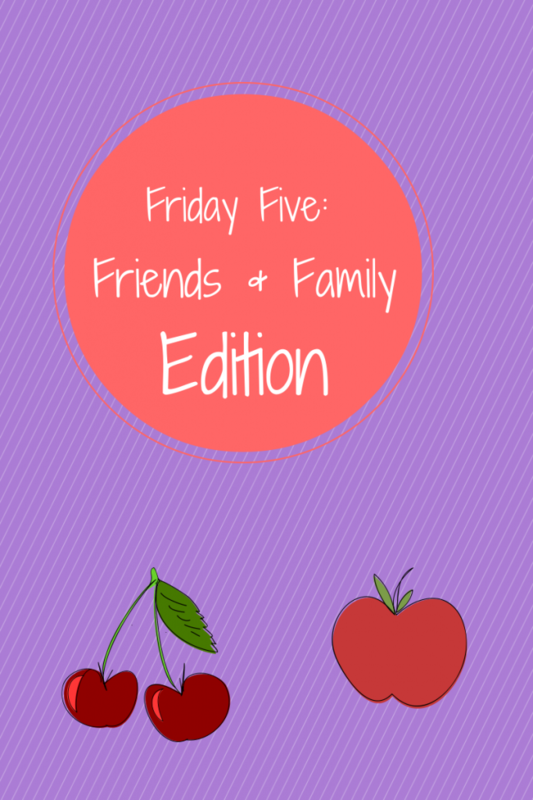 Make sure to link up your Friday Five post and be sure and link back to the linkup! Love it – great tips! Cynthia @ You Signed Up For What?! recently posted…Thanks For Finally Arriving, Spring! Love that your fiance is interested in heating healthy! Sometimes it can be a struggle to get the guys “onboard”! I’ve been really working to get my boyfriend to enjoy eating healthier, and I think it’s starting to sink in. We eat much better than we used to and I’m constantly challenging myself to make great meals for the both of us. I love the sharing healthy recipes bit 🙂 Some of my christmas gifts to people this year were jars of an almost ready to eat lentil dish with the recipe attached. They were a big hit and the recipients still have an easy, economical, and healthy recipe that they can use in the future. now that is awesome! great idea! I enjoy running around with my children but other than that – I really do not like to work out with my husband. He goes NUTS in the gym. I have walked with my mom on my favorite trail when she is in town so that is always enjoyable. I basically work out with my trainer, coach and friends. sounds like you’re sharing the fitness love to me! Good tips – especially about keeping it real! I think it helps others to see both your highs and your lows. i agree — everyone has ups and downs — why not be real? I love all your ways of sharing with your friends and family!! I also love that you keep it real, that is one of the best parts of you and this blog! Have a great weekend! thanks sara – i think sharing when things don’t go as planned just makes the blog way more authentic. i’m kind of an over-sharer in real life, anyways 🙂 happy weekend to you as well! I wish I could get my husband to eat my cooking! I’m not terrible, but he always just ends up stopping and getting something (usually unhealthy) on the way home from work. That’s a habit I’ve definitely been trying to break. hmmm…maybe he needs the promise of something extra special for dessert if he waits to eat your cooking for dinner 🙂 lol! yeah, i didn’t think this week would ever end 😉 it’s been far too long since we’ve run together 🙁 soon, very very soon! Mar @ Mar on the Run! 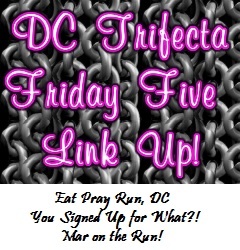 recently posted…Friday Five: Spread the Health! FAR too long BRF! FAR too long! Glad you are feeling better! I love that you are public about your successes AND failures! Talk about a healthy mind, body and soul! That is the best way to grow. I love showing my boyfriend that healthy can be tasty! Glad you are feeling better! I love it when my husband likes something that is considered healthy! Thanks for the shout out and also for going along with my idea for this week 🙂 That’s great that you are encouraging your fiance to eat/cook healthy. When we first got married, my husband didn’t really like vegetables. It took time, but now he actually ASKS for them, lol! Keep pressing! Michele @apaceofbalance recently posted…Friday Five: Family, Friends and a Giveaway! I love that you’re open and honest about your ups and downs. I’m trying to be more open about mine, especially the downs. I often fear that I’ll disappoint readers if I can’t follow my training plan to a T, but then I also realize that things come up and that’s what makes my life more realistic. I can resonate with your list of five! Particulary sharing recipes and encouraging others towards their goals (whether it be healthy eating, fitness, running etc). Blogging has been a great outlet to voice both the ups and downs, and glad to meet such a great support system in this community. Oh yes, sharing recipes!! I forgot to add that to my list. Thanks for another great link-up! !